Brass body with two spring loaded poppet-type valve modules and threaded female union inlet and outlet connections. Internal strainer screen, and stainless steel springs. Suitable for hot (up to 180 F [82 C]) or cold water under continuous pressure. 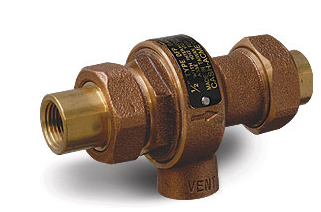 Prevents backflow of contaminated water into potable water supply lines. Ideal for boiler feed lines, dairy processing systems, livestock water sources, chlorinators, trap primers and similar installations.